When I tell people I’m using a solar oven, they’re impressed. Or at least that’s how I like to interpret the reaction; it’s possible the raised eyebrows and “wow” indicate a lesser sentiment. Earlier in the summer we dared our readers to cook with a solar oven. Even I was wary. I had tried it a few years ago and it was a lot of work with unimpressive results. But that was before I discovered the use of a windshield sunshade. Now I think solar cooking is easy. And yes, it works. I stuck a roasting thermometer into my cooking vessel out of curiosity. It got well above 200 degrees, high enough to cook food and kill problematic bacteria. Reflective windshield sunshade. Solar ovens typically have some kind of reflective surface that catches and directs the sun’s rays to a cooking vessel. Sure, you can get all high-tech and labor intensive with that or you can just grab a windshield sunshade and bring the bottom edge together to create a funnel. I also creased the back of it to make a flat space for the cooking vessel. Spend the extra few bucks to get a shade that is sturdy. Cooking vessel circulation. You will need to prop up your cooking vessel so hot air can circulate underneath it. I used two nearby materials, rocks and some glass jars waiting to be recycled. Rocks were fine, but the jars worked best. I set them on their side and placed the flat oven surface on top. Cooking vessel. The easiest “oven” to use is a dark colored ceramic slow-cooker dish with a glass lid. Not a dutch oven. Not a white slow cooker. You can also create a cooking vessel with a dark non-stick pan and an oven bag, the type used to roast a turkey or chicken. This is what we started with, but we don’t like plastic-flavored cookies, so we looked for an alternative. You can put a dutch oven in an oven bag to minimize the plastic flavor, but it’s not as convenient to check on what you’re cooking. A cloudless day. 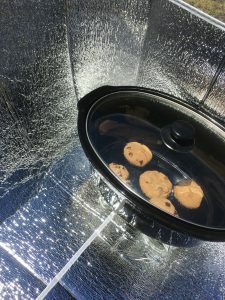 Clouds make a bigger difference than outside temperature when it comes to solar cooking; a solar oven doesn’t get nearly as hot when there are clouds — even if they are thin ones. From what I understand, a solar cooker even works in the winter, as long as it’s a clear day. Uncooked food. 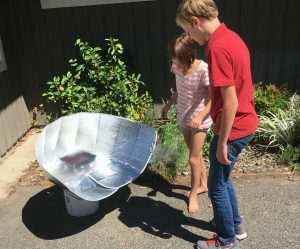 If you can make it in a slow cooker or oven, you can make it with a solar oven. We baked cookies, brownies, fruit crisp and a salsa chicken meal in our solar oven. I’ve read you can also make rice, pasta, potatoes, various meats and more. Safety wear. You won’t want to use your solar oven without sunglasses for the same reason you don’t want to look at the sun without them. You’ll also need hot pads or towels to remove your cooking vessel. Once you have all these components, set up your oven and point it toward the sun, lining it up as directly as possible. Depending on what you’re making and the number of clouds in the sky, you will need to rotate your oven as the sun moves. Check on it every hour or two, if possible. 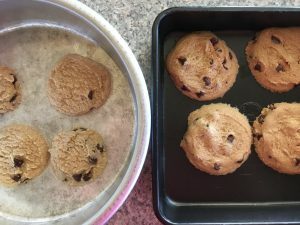 On a good day, cookies and brownies will take around an hour to an hour-and-a-half to bake — longer if conditions aren’t ideal. If you’re cooking a pot full of chicken, on the other hand, you’ll need five to six hours or more. It is kind of amazing that a windshield shade and slow-cooker dish can get the sun to bake cookies. And the end result is delicious.